Gorman-Rupp’s TankleenorTM provides quick, efficient and economical cleaning of petroleum storage tanks. The unit is a lightweight, wheelmounted cleaning system designed for one-man operation and is easily moved from job to job. Even when tanks are thought to be free of moisture and foreign debris, they often contain enough water and other contaminants to degrade the stored product. The Gorman-Rupp TankleenorTM can remove contaminants including gel precipitates, microbial growths, rust and water, without disturbing the product or taking the tank out of service. Operating liquid drawn from the contaminant tank circulates through the pump and creates a vacuum at the eductor. 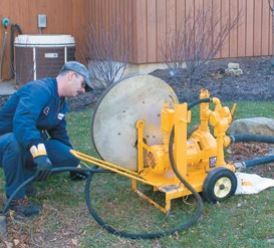 The vacuum draws moisture and contaminants through the cleanout hose and back to the eductor, where it mixes with the operating liquid and is carried to the contaminant tank. 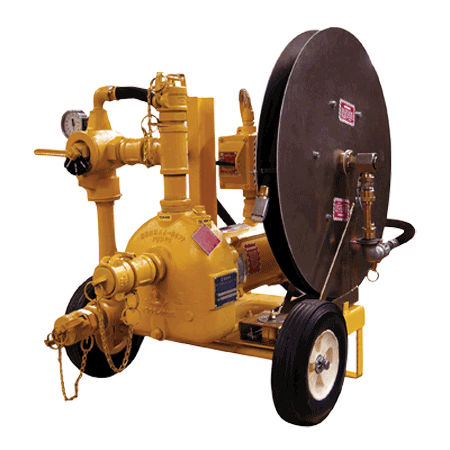 At the heart of this system is a 2” Gorman-Rupp O Series® self-priming centrifugal pump with Viton® or Buna seal, close-coupled to a 1 HP Class 1, Group D, single phase explosion-proof TEFC electric motor with 50’ (15 m) of 12 gauge, type SO cable. The pump is equipped with a venturi-type eductor which permits recirculation of the operating fluid without contaminating the tank, and a handoperated valve for backflushing. The discharge and suction ports of the pump are fitted with quick-connect couplers.